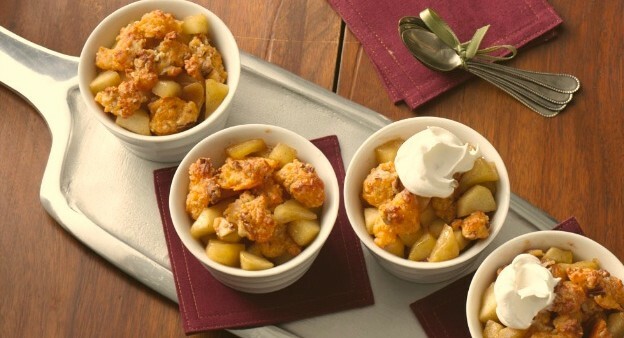 Lightly spiced apples get topped with a crunchy, crumb topping full of savory cheddar cheese. 1. Heat oven to 400F. In medium bowl, mix pie dough, pecans, powdered sugar and cheese until well blended. Place crumb mixture on parchment lined baking sheet. Bake 12 to 14 minutes or until golden brown. Cool; crumble. 2. In 12-inch skillet, melt butter over medium high heat; stir in sugar. Cook and stir 2 to 3 minutes or until mixture begins to caramelize. Stir in apples, lemon juice and cinnamon (caramel will harden). Reduce heat to medium; simmer 8 to 10 minutes, stirring occasionally, or until apples are tender and caramel is dissolved. Cool. 3. Spoon apple mixture into six 6 oz ovenproof ramekins. Top with crumb mixture. Bake 5 to 6 minutes or until warm. Top with whipped cream or vanilla ice cream, if desired. Preparation time: Prep Time: 15 Min (Start to Finish: 50 Min). Nutrition Analysis: 720 cal, 46 g fat, 50 mg chol, 700 mg sodium, 69 g carbs, 5 g fiber, 36 g sugar, 12 g protein.